Steve Schwolert, the Exhibit Coordinator at the Austin History Center, recently sent along some interesting comments about the differences (and similarities!) between museums and archives that I'd like to share with ExhibiTricks readers. As you'll see, Steve also sent along some cool photos and descriptions of a simulated Kinetoscope that he's made using iPods! The Austin History Center is not, strictly speaking, a museum. We hover somewhere between museums and libraries. We are, rather, a research institution that collects archival documents (records of all types, including over a million photographs, films and videos). It is a distinction that most people miss who do not use archives on a regular basis. Exhibits in our setting function to educate, promote our collections, and as a vehicle to encourage citizens to donate archival materials that record Austin’s history. Through our exhibits, and Community Liaison program to underserved communities, we’ve unearthed a number of significant collections that record our area's history. In many cases, it is unusual to have a vibrant exhibits program in archives, unless perhaps you are one of the big boys like the Harry Ransom Center or the National Archives. Though we rely on the skills of all our staff for research, I am the entire “official” exhibits staff. I do all the design and fabrication as well as the promotional graphics. Figuring out how to make the distinction between archives and museums clear is something we at the Austin History Center are working on all the time. We need better “elevator speeches” and have put some effort into marketing ourselves in the last couple years. All that said, I get a lot of good ideas and inspiration from being a “fly on the wall” around people in the museum world. So the long and short is that there is some crossover, but archives are still a bit different. I will say that with the success of our exhibits program in the last few years, exhibits are now a core service whereas they used to be ancillary/optional. Creating exhibits for an archive is unique in that we deal with 2D “objects” almost exclusively. Any 3D artifacts are usually more complimentary of the materials we collect – photos, documents, letters, architectural drawings, maps, film and video. I often joke that my world is one of arranging rectangles. Coming up with ways to present the materials in a dynamic way is always challenging. But we have found that exhibits serve to help us expand both our place in Austin’s cultural community and as a vehicle for expanding our collections, with our overall goal being to collect, preserve and provide access to the primary source materials that record our local history. 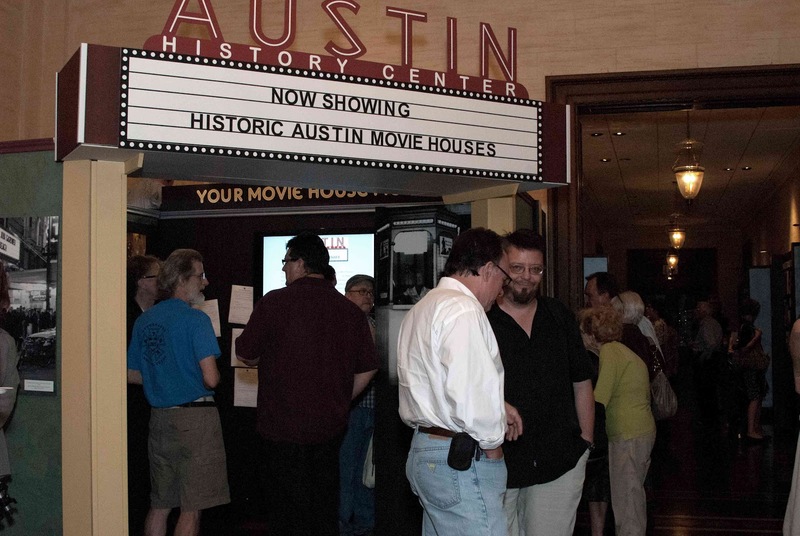 I am notorious for trying things I’ve never done before, so with our latest exhibit called “The First Picture Shows: Historic Movie Houses of Austin,” I wanted to give our visitors a sense of what it was like to watch movies in a context that has vanished. Giving a broader context in which to set the stories found in a local archive is something we try to do in each exhibit. Reading the ExhibiTricks blog inspired me in this way, and so I thought “why not?” and built a version of the Kinetoscope – the first device created by Edison and widely distributed in the US for watching movies. Edison actually imagined it first as a way to generate interest in his Phonograph, and thought movies would only appeal to a viewer more like an arcade entertainment. Edison’s Vitascope projector came along in 1896 and was the first system that was commercially successful in the US. Our Kinetoscope runs on iPods – two for digitized Edison films from the National Archives and one for audio, all set to loop continuously. The iPods (Nano, 3rd and 4th generation) are AC powered using adapters and have been running continuously for well over a month now with no signs of quitting. The two iPods for films are rigged in a box approximately 12” deep with a glass magnifying lens scavenged from older magnifying glasses inserted halfway between where the viewer looks and the iPod itself. The boxes are then mounted into a sleeve inside the cabinet which I can remove as needed. 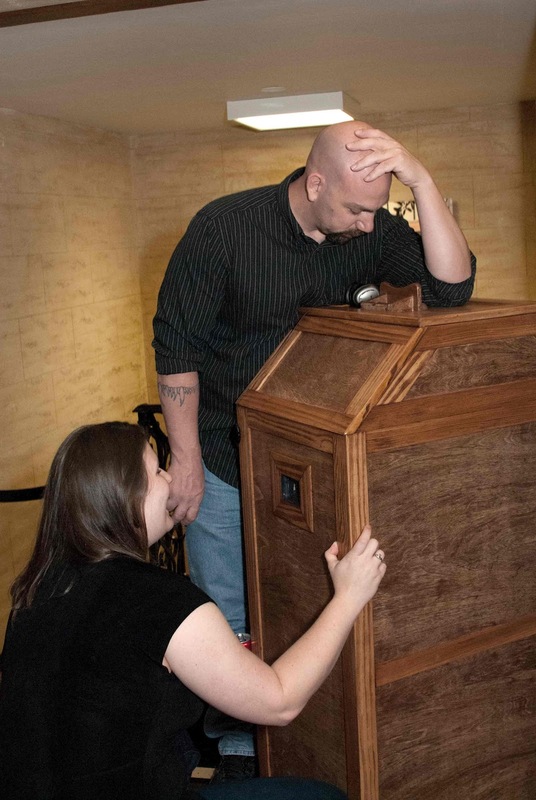 One concern was with accessibility, so unlike an original Kinetoscope, I made a window in the front of the cabinet for those who cannot look in from the top. To loop the media, I simply put the films and music into a playlist on iTunes and set it to repeat. The audio is a recording of an old piece of Ragtime piano music from our collections composed for the opening of Austin’s Paramount Theater in 1915. Ironically, movies, not to mention music, are moving back to the individual experience of the personal device much like the Kinetoscope was in its day. Maybe Edison understood something about film that only the technology of our era has been able to actualize. We’ve discovered that movies really hit a nerve with just about everyone, and so we have created a way for visitors to contribute their own “Movie House Memories” by giving them a place to post them in the exhibit. I am periodically posting these memories on our Facebook page, taking that conversation one step further. Our tagline is “Discover Your Story” and it is my desire to create experiences that bring viewers deeper into our shared history as a community by sharing their own story. When a collection is donated to the archive and then used for research, this is exactly what is happening. Figuring out how to reflect that in our exhibits is “the dream” you might say. And I want that experience not only to be insightful, but fun. 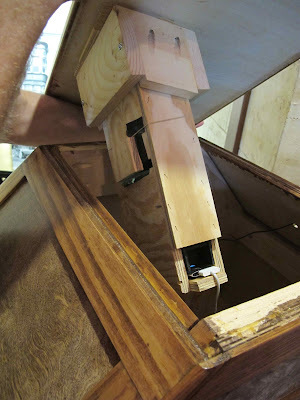 That’s why I built the Kinetoscope – for fun. Why not? Thanks Steve! 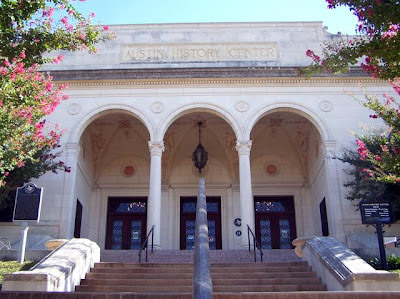 You can find out more about the Austin History Center by visiting their website or by checking out their Facebook page.